Are you looking to install a new lawn on your property? Maybe you’ve just purchased a new-to-you home or property and the lawn is in poor shape? There is a lot to know about getting grass to properly take root and grow into a healthy, vibrant, lush green lawn. It’s not as simple as throwing down grass seed and waiting a few weeks. Why Do You Need A New Lawn Installed? Do you need a new lawn for a new construction project? Are you trying to renovate an existing lawn that is in poor shape? Do you want to improve your properties appearance? Are you embarrassed that your lawn doesn’t look as great as your neighbors? Silver Lining Landscaping is a landscape contractor serving Brownsburg, Indiana and serving the surrounding area. We specialize in installing new lawns for our residential and commercial clients using both grass seed or installing new sod. From grading and preparing your lawn area with proper loam soil, installing proper lawn drainage, organizing irrigation or sprinkler installations, and spreading the grass seed or rolling out sod we can provide you with a beautiful looking new lawn. 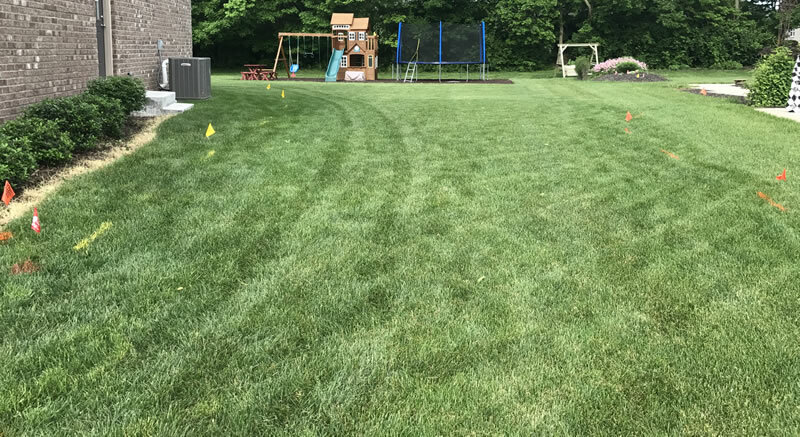 We’ve installed dozens and dozens of new lawns for new homes and property development in Indiana and we are happy to get your new lawn installed properly. We assess the existing soil and take note of any grading or drainage issues. We will bring in top soil and spread as needed to ensure a uniform surface. We can arrange to have irrigation and sprinklers installed at the same time if you like. We then spread out your grass seed or roll out sod. For most average sized lawns this entire process can be completed in just 1-3 days. For much larger residential lawns or commercial properties the process can take longer but the end result is exactly the same. You’re going to end up with a beautiful, lush green lawn. If you’d like to schedule a consultation with us to discuss your new lawn installation we’d be happy to meet with you. Please call (317) 902-5411 or fill out our online form and we’ll get right back to you.